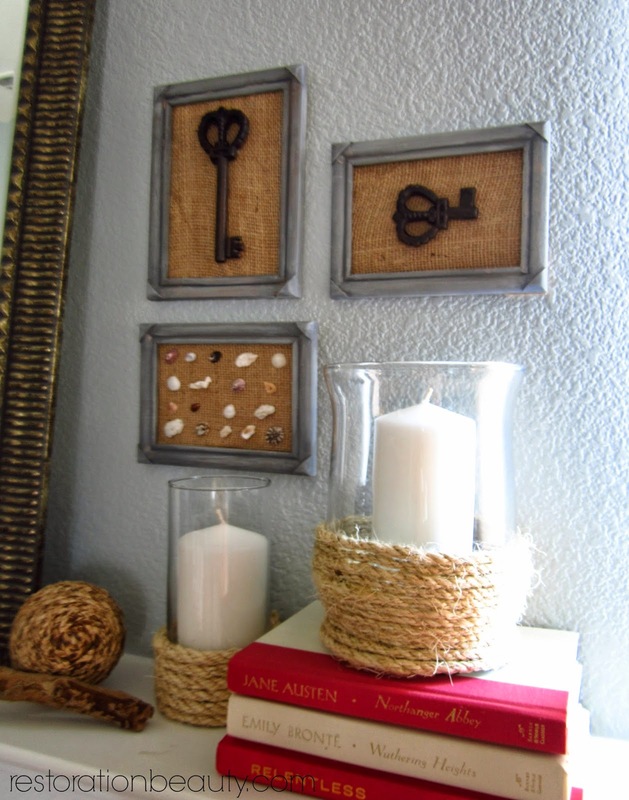 Remember my Framed Keys On Burlap Keepsake Art? Well.....I made something similar but this time using some teeny tiny sea shells Lily found during one of our beach trips. She was so excited to have so many and was so amused with their miniature size. How could I just let them remain in a boring "memory box"? No no. That would not do. These little SEASHELLS HAD TO BE TURNED INTO SOME SPECIMEN ART for all to see. I guess it's safe to say that I love turning memories into art. So far I've turned Fingerprints Hearts, Special Date Keepsake and the above mentioned Framed Keys into art. And I'm warning you now....this is only the beginning. I. AM. OBSESSED. I especially love this one because it just screams SUMMER!! 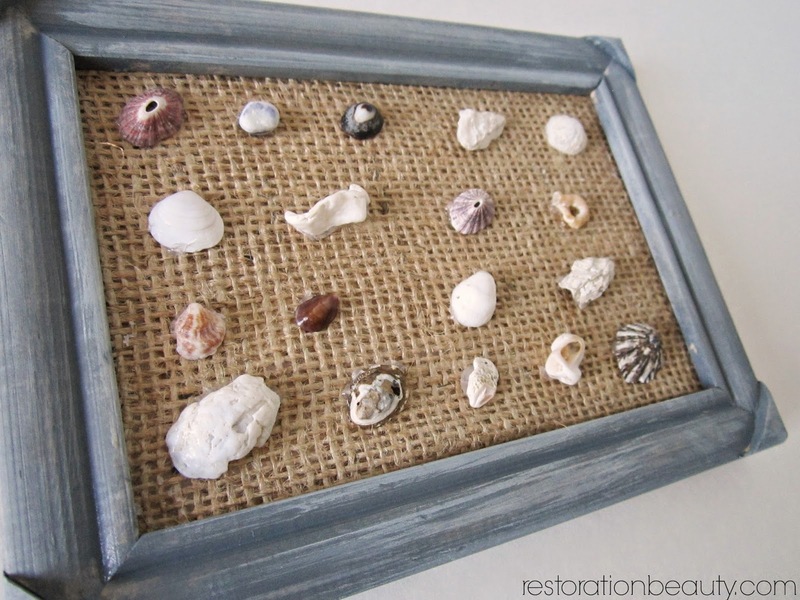 To make my mini seashell specimen art, I simply used my glue gun to glue each seashell to a burlap piece cut to fit my frame. These shells are tiny so there were a lot of burns to my fingers. Ouch! Once I finished gluing each shell (which didn't take long at all), I inserted my burlap (that I glued to the back-piece of the frame) and it was ready to be hung or displayed! 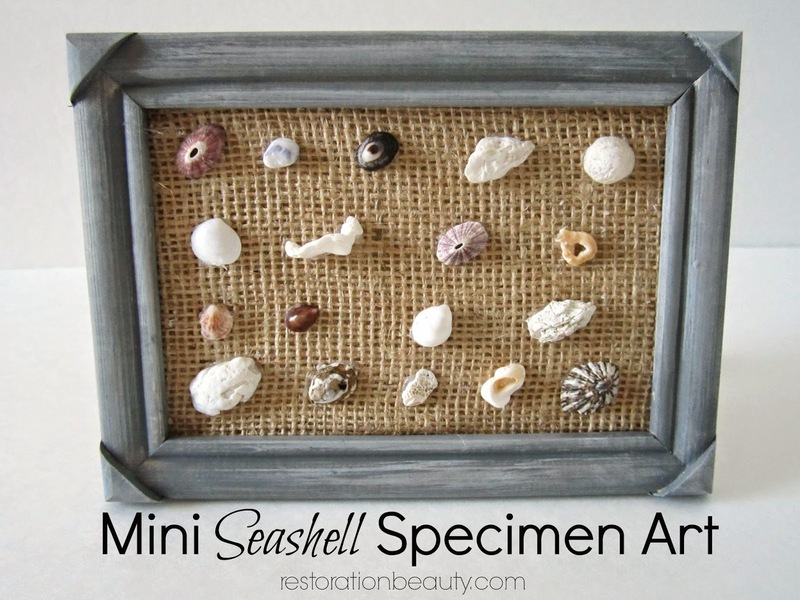 Choosing a spot for this DIY seashell specimen art was the hardest part! And it doesn't help that I'm very indecisive when it comes to home decor....anyone else? It went from my gallery wall, to my entry table, to my sofa table, and finally landed a home above my mantel. I just added some keys to the mix so they wouldn't be so lonely. Who knew this piece was going to be so high-maintenance? I love the way they look by my Roped Candle Holders and love how this little area really adds to the nautical theme that's been slowly creeping into my Living Room this summer. I'm sure you're all going to go look for all those seashells that have accumulated over the years in boxes, right? I don't blame you. I'd do the same thing! What else do you think would be cool to incorporate as art and a keepsake? I'm on a roll so would love to hear of more ideas! It looks perfect with the keys, and I agree, it's nice to see and touch things like these rather than just look at them from glass! Thanks, Lisa!! 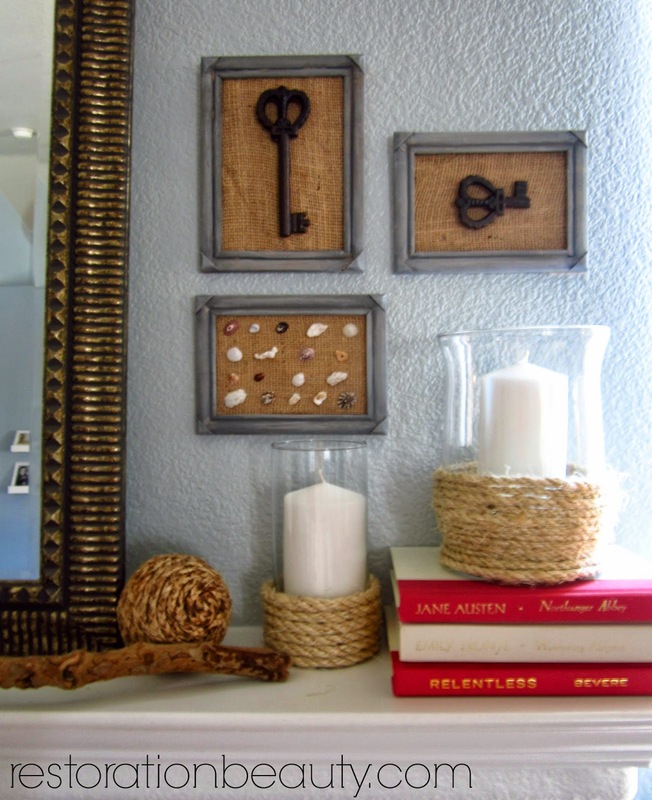 Isn't nautical decor so fun in the Summer?! Thanks, Vel!! Glad you like the glass less look! 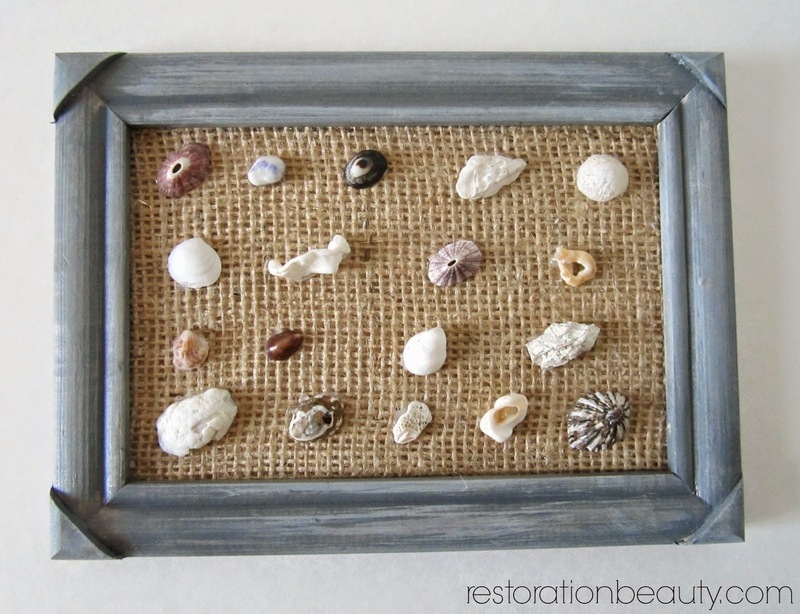 I used my shells to decorate the frame. I love this too though I will have to go make one! Hi, Emily!!! So glad you liked this project!!! Aren't shells so much fun? Hi, Madalyn!! So happy to hear from you! !